The ever popular Dutch Iris. Whilst it is available in White and Yellow, it's mostly popular for it's deep blue colour which is a rarity amongst cut flowers. Medium to Tall stem length ( 30cm to 70cm ). Medium vase length. A delicately scented flower, popular worldwide. Normally short stemmed, they work well as part of a posy alongside the likes of Roses and Hyacinths. Medium vase life. A true winter favourite, tulips are both stylish and elegant, and are available in a variety of colours with the most popular being pinks and purples. Short to medium stemmed (30cm to 60cm). Medium vase life. One of our top sellers and for good reason. Available in many varied colours and suitable for any occasion. 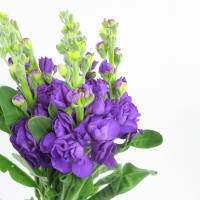 Short to tall stemmed (20cm to 90cm) depending on the arrangement. Medium to long vase life. 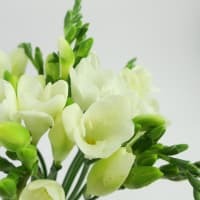 Available in a wide variety of colours, LA Lilies go well with many different types of flowers and is a regular favourite in bouquets and arrangements. Medium to Long Stemmed ( 30cm to 100cm ). Medium to Long vase life. Available year round, these flowers general have a long vase life with proper care. Chrysanthemums come in almost every colour except blue, and are a very popular cut flower. Medium to Long Stems (30 to 80cm). A firm favourite when you need to brighten someones day. 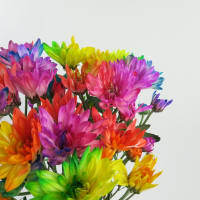 Large bright flowers for when you need colour right away without waiting for flowers to bloom. A versatile flower that comes in a wide spectrum of colours, an interesting texture makes them wonderful additions to a bouquet. Medium to tall stem length (30cm to 70cm). Medium vase life. Whilst delicate in appearance these flowers are hardy and known for their long vase life. Very soft in texture and almost Rose-like in appearance. Medium to tall stem length (30cm to 70cm). Long vase life. Orchids typically have a dozen or so flowers per stem with ranging in colour from white to purple and even blue. Stems are short which makes them an ideal companion for Tulips or Antheriums. Unique, elegant and spectacular, a popular choice for bridal bouquets, these flowers are simply stunning. Long lasting, hardy flowers perfect for the patriotic Aussie or for people who prefer low maintenance, low water consumption flowers. Goes mostly with other Natives, but can also go with Lilies. A bushy flower that starts with closed blooms and opens up into a sea of tiny pink flowers. Perfect in posies and smaller arrangements. 30 - 40cm Approx. Medium vase life. 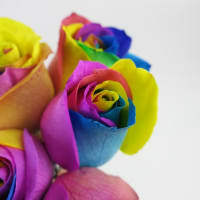 These funtastic roses really pop with all the colours of the rainbow. VERY popular at the moment to send as a fun gift with a 'wow' factor (they'll definitely be talked about at the office). Approx. 50 - 60cm. These roses typically have a shorter vase life than standard roses, but they make up for it in fun-factor! 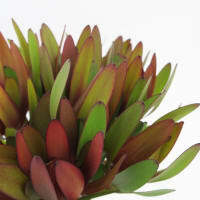 Normally available in the cooler months, stocks works well alongside Lilies, Snapdragons or Malacca Balm. Medium stem length (30cm to 60cm). Short vase life. After something completely different? These might do the trick. Shaped not unlike coral (some also call them brain flowers for the wider varieties resemblance to brains). Available mostly in red and purple with a velvet like feel - a definite talking point if sent to the office! Medium stem length (30cm to 60cm). Medium vase life. Known for their strikingly bold colours and almost unreal look and texture, we can assure you these are very real! These tropical flowers can bring an ultra-modern touch to an arrangement and look just as impressive in a minimalist style vase. Approx. 20 - 30cm. Medium to long vase life. 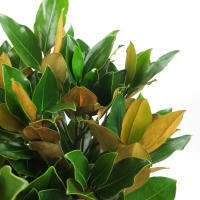 Long lasting foliage with glossy dark green leaves. Sim carnations have made a comeback over recent years, frequently finding their way into more and more arrangements, especially if rustic pretty is your thing (shouldn't it be everyones?). One flower per stem with a larger head than their standard cousins, sim carnations come in a large variety of colours and have a long vase life. Disbuds are a Large, bold chrysanthemum flower with a honeycomb style pattern. These flowers are popular on Mothers day and can also pack a punch as the centrepiece in a small posy. 40 - 60cm Approx. height. Short to Medium vase life. 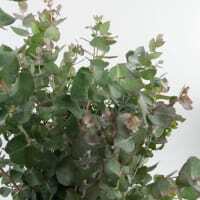 If you need an Australian flavour to your bouquet or arrangement, Eucalyptus is your go-to foliage. It can help make a bouquet look larger than life and give an air of wildness to a bouquet. 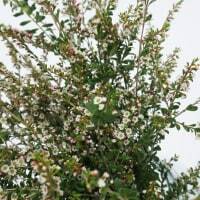 Also known as Baby's Breath these tiny delicate blooms are an excellent accent flower paired with roses or added to mixed bouquets. Gypsophila last approximately one week and can also be dried. 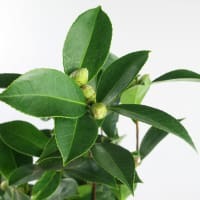 A hardy flower used frequently in Australian native style flower arrangements (they're actually a species from South Africa, but they look so good paired with Australian natives, we can't resist the match-up). Long vase life, approx. 30 - 50cm tall. Need to send a talking point? 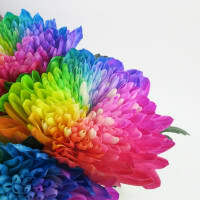 Watch people ooh and ahh over these multi-coloured rainbow Chrysanthemums. Medium vase life, 30 - 60cm tall approx. Bold, bright and all the colours of the rainbow (of course!) These disbuds are a new twist on an old favourite and are have their mood meter set strictly on FUN! Approx. 50cm tall. Short to medium vase life. Spray roses differ from traditional roses primarily in size. These sweet little roses typically have many blooms per branch and have intricate and beautiful looking flowers. Hearts melt at just how cute these beautiful flowers are - they make a perfect posy. Approx. 20 - 40cm tall. Medium vase life. If you want to steer away from traditional style flowers, Sea Holly might be what you're after. These spiky looking blue flowers are both intriguing and impressive for their colour and shape. Approx. 40 - 60cm High. Long vase life. Also known as 'Dusty Miller', these leaves really do have a suede-like texture to them. If you're after something a little different to pair with your flowers this might do the trick. Due to it's short height it works really well in petite posy style arrangements. 20 - 30cm. Medium vase life. Speckled with small white and/or pink flowers - this flower is native to Australia and is beyond pretty as a filler flower next to accompanying centrepieces. Typically around 30cm. Choose a preferred colour, or enter more specific instructions(subject to availability). We will make your order up to the amount requested. Choose delivery suburb and date. Great choice! We've updated the list of choices with some flowers that work well with your selection.